Izzi Oil Ltd (IOL) is an international commodities trading company that specializes in Energy . Dealing in buying and selling of the associated physical commodities like crude oil and crude oil derivatives. The Oil and Gas brokering and trading desk focuses on crude oil, diesel fuel and other associated products, creating a market for both buyers and sellers. 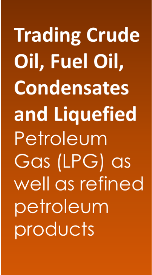 Our Energy sector is trusted by many companies for the supply of petroleum products . IOL maintains strong links with a diverse producer base in regions including Africa, Asia, Europe and the Americas. We identify buyers and suppliers in different geographic regions, to promote trade between parties and provide access to a diverse marketing network through our simplified purchasing and sales process.